Ok, I admit it. I had little to no idea what I was signing up for when I entered the inaugural Devon Coast to Coast Ultra. The problem is, I don’t think anyone else did either, including the organisers, Climb South West. The otherwise comprehensive information on the Climb South West website gives no indication of how difficult or challenging the event might be and I don’t think anyone could have predicted just what the course would offer up on its first appearance as a 100 mile ultra. Publicity videos for the Two Moors Way depict picturesque villages nestling in gentle valleys. Rolling downland and green pastures bathed in sunlight. Take a look at this video https://youtu.be/zecAnzj09pk and twomoorsway.org and you will see what I mean. “A gentle unchallenging landscape”, “Sheltered wooded valleys, sparkling rivers, small stone-walled fields”. After the weekend I had, I can tell you, nothing could be further from the truth!! 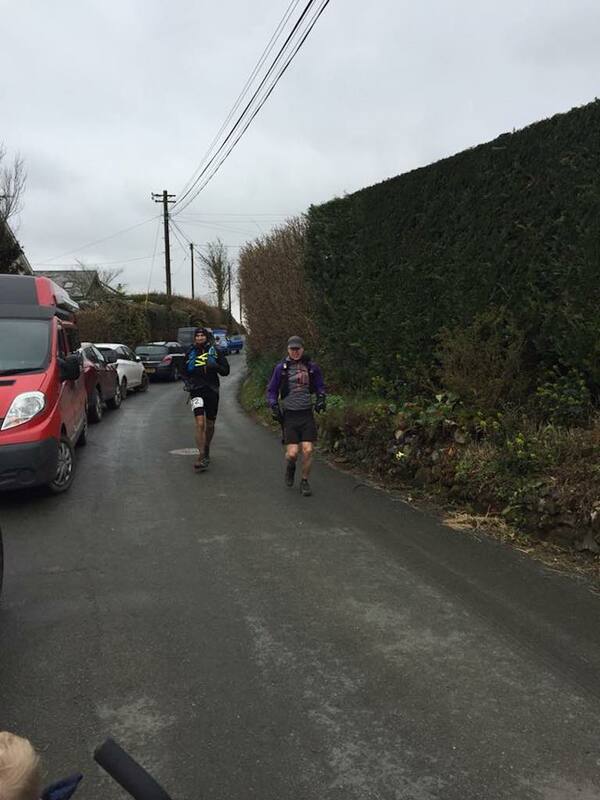 Having completed the Arc of Attrition 100 in February, I was keen not to overstretch myself, and on paper, the Coast to Coast Ultra initially looked like a relatively sedate run, with a generous cutoff. I guessed we could probably amble around in 30 hours without pushing too hard. Since finishing a lot of people have asked me to compare the Arc and Coast to Coast. I think it’s an unfair comparison to try to make. The Arc is now an established event with a big name sponsor run by an experienced team. Coast to Coast is a brand new event from a team learning the business of putting on these kinds of events. That said, some comparison is unavoidable. My running wife, Richard and I stayed with our families in a caravan in Challaborough about 10 miles from race start at Wembury. Let me tell you, ultra runners preparing for a race, needing a calm, relaxing environment in which to focus their minds and bodies, should consider whether sharing a small berth with four children and two wives is going to be conducive to that end. But we love them and we wouldn’t have it any other way and to be frank, I don’t know what they’d do without us! Victoria drove Richard and me to the start on Saturday morning. I’ve been to Wembury Beach before. A couple of years ago I made a short film with my friend Martin Yelling as he attempted to run the entire South West Coast Path. You can watch that here, but don’t forget to come back. Suffice to say, the weather was a lot better when I last started running from Wembury Beach. Registration and kit check was carried out in the car park under the cover of two canopies. We were issued with a GPS tracker which friends, family and race HQ could use to follow our progress along the route. Looking around the assembled group, the demographic was certainly different to that of the Arc of Attrition. There you will see weatherworn faces, pockmarked with the experience of multiple days on the hills. Here the line up was much more green. Some runners looked like they were gearing up for a 10k fun run rather than preparing for up to 48 hours on the moors. They obviously read the same literature I did about rolling hills and picturesque villages. One or two runners got pulled up because they didn’t have a waterproof jacket or the required survival bag. To be fair, the mandatory kit list is more suggestive of how challenging the run is likely to be than any other information you might come upon. Race Director Justin Nicholas gave the race briefing. I must admit that I know next to nothing about Climb South West. An initial look at the website suggests their primary focus has been climbing and mountaineering. I guess the name of the company gives that away. But more recently they have been delving into the realm of trail running. 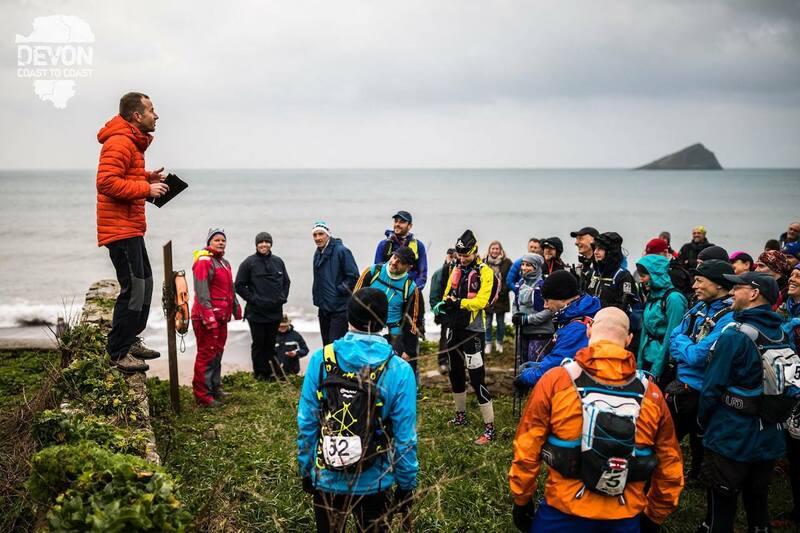 There are a number of trail running events listed on the site but my understanding is that the Devon Coast to Coast Ultra is only the second or third to actually take place and there don’t appear to be any ‘results’ available for other runs. Happy to be corrected. Suffice to say, Climb South West are yet to establish themselves as a bona fide race company. Justin is no stranger to ultra trail running though, having completed the Arc of Attrition earlier in 2018 in a very good time. He also ran a few Endurance Life events a few years ago, although anyone who reads my race reports regularly, knows how I feel about Endurance Life!! But each to their own. Having run the Arc, Justin certainly knows what good looks like when it comes to race logistics. We listened intently to the race briefing where there was talk of mud. Justin also gave out some course instructions which, it would later become apparent, I didn’t listen to intently enough! Finally, the Race Director asked that any positive feedback on the race be plastered all over social media, but any negative feedback should be emailed to the Climb South West team after a couple of days cooling off. I don’t recall hearing much about medical cover or safety procedures. But, in truth, I was concentrating on filming so I may well have missed this part. The race started a little late. It didn’t bother me at the time but a few people were concerned that this gave them less light at the end of the day. I suppose 15 minutes is 15 minutes. From the outset, we were immediately into the mud!. The run initially takes the Erme-Plym waymarked trail from Wembury to Ivybridge. On the exploredevon.info website, the route is described as generally easy path and gently undulating. In most circumstances, this would be true, but the fact that it took us 3 hours 17 minutes to cover just 14 miles tells it’s own story. There was minimal climbing in this first section but the mud was already relentless through the fields and wooded areas. The weather didn’t know what to do. Sometimes it was windy, cold and wet. Then the sun would make an appearance and it was quite warm. Suffice to say we saw a beautiful rainbow early on in the run. Along the route the Climb South West team had positioned three main aid stations and various smaller water/snack stops. The race is described as fully supported unlike the Arc of Attrition where you really need a crew. One of these stops was in Ivybridge prior to our ascent on to Dartmoor. We were required to register our race number too before carrying on. Ivybridge is the start of the Two Moors Way, which is the route we would be following from this point on. There is an engraved stone on Stowford bridge, next to the old paper mill, marking the start of the Two Moors Way. We actually came across some snow on the climb up to Dartmoor. I have to say it is stunning once you exit the lane leading up the hill and you come out on to the moor proper. The barren, unforgiving landscape is awesome. Classic British moorland. The climb up is long and gradual. Richard and I made good progress here, running much of the climb and passing a good few people. The weather was deteriorating the higher we got. I took a tumble whilst filming and grazed my knee, but no major harm done. It was around now that I realised I had made a ridiculous error. For some reason I had told our support crew that we would be coming into the River Dart Country Park at around 4 hours into the race. Why I had even thought that I don’t know. The route goes absolutely nowhere near the River Dart Country Park! I had just assumed that because Race HQ was there that it was on the route. But no. After various texts and phone calls between partners and furious apologies on my part, we sorted it out and saw our two families at the first official checkpoint at around 27 miles in the village of Holne. Our only major navigational issue came just after this at the River Dart crossing. Having dropped down off the moor, we now needed to get back up again. All the signs pointed left but our GPX map pointed right. Initially, we went with the signs as Justin had suggested we do, but when another runner approached us coming back we decided to turn around and follow the route on our watches. As it turns out the waymarked route was probably quicker and easier, but we eventually made it up the huge climb to Aish Tor. By 37 miles we had reached the highest point of the race at Hameldown Beacon, just under 500 metres above sea level. It was everything you expect the moors to be. Wild, rugged and windswept. It’s a harsh beauty made more so by the menacing dark clouds overhead and the constant threat of rain. As dusk was falling we finally began to drop down off Dartmoor and reached one of the many small pop up aid stations at Chagford. These were situated every 10 miles or so along the route and provided limited snacks and water top up. We passed the Chagford open air swimming pool and on we went into the night. This was to be one of the most arduous nights running I have ever experienced! The countryside between Dartmoor and Exmoor is not especially picturesque or unique. Especially in the dark, it is merely a series of squelchy farmers fields and villages. We basically trudged the night away from the second official checkpoint at Hittisleigh, through Clannaborough Barton, Weeke and Washford Pine to another of the smaller aid stations at Witheridge. The mud was relentless and the entire night was tough going and pretty tedious. It was 5am when we set off from Witheridge in the early morning light to find the final official checkpoint at Yeo Mill. I recall there being quite a lot of road running in this section, as the sun came up and filled us with that renewed energy one gets in these situations. Oddly enough, with the advent of the new day and reaching the final checkpoint, it felt like we were nearly home. In reality of course, we still had 27 miles to go over the whole of Exmoor on very tired legs! Continuing to follow the Two Moors Way and the GPX file on our watches, we ran through West Ansty and Hawkridge to reach the River Barle and the famous Tarr Steps. These are big stone steps, known as a Clapper Bridge, across the river which are a scheduled ancient monument and a Grade One listed building. We turned left after the bridge and followed the river for what seemed like forever, until we reached Withypool at around 95 miles. Up over Cow Castle and Flexbarrow to Simonsbath where we began the climb up to the highest point on Exmoor. It was here, having not seen another runner for hours, that we finally spotted a group up ahead. Richard was feeling stronger than me and he pulled ahead to try and catch them. We weren’t sure if they were in the non stop or the four day event at first. But as Richard got closer he started waving back at me furiously, telling me to catch up. Incredibly, with four miles to go, after 108 miles and 32 hours of running, I put in my third fastest kilometre of the run at 6.08min/km. It was a group of four. One was a pacer, one was a four day walker, but two were in the non stop run and were now walking the rest of the way home. Richard and I carried on running as the rain started falling heavier and heavier. With only three miles to go on my watch I was getting worried because I couldn’t see the sea or any sign of a town up ahead! Sure enough there was a sting in the tail of the Two Moors Way. We dropped down off Exmoor at Cheriton Hill only to find ourselves climbing back up 250 metres through the forest, twice, before eventually dropping down some very sharp switchbacks in to the finish at Lynmouth. I have rarely walked to the finish line of any race previously. But Richard and I had so little left in our legs that we could do nothing but amble the final 200 metres to the seafront in the rain to shake the hand of The Walker. The sculpture by Richard Graham stands at the end of the Two Moors Way, at the intersection with the South West Coast Path, on the esplanade at Lynmouth. For Richard and I, the race ended after 33 hours in a comfortable cafe, drinking coffee and sitting in the warm. For some however, things were not going so well. The weather was deteriorating and many runners were still out on the top of the moors as darkness fell on the second night. I’m also aware that the cafe we were in closed not long after we left and this meant that a few runners arrived at the finish in the cold, wet and dark with nowhere to shelter or get any refreshments. I’d certainly advise Climb South West to have improved facilities in place at the finish line next year. For a company new to putting on these events, it’s difficult to be overly critical. If I am to be so, I would suggest that both the registration and finish areas need to be covered, warm places with food and drink available. 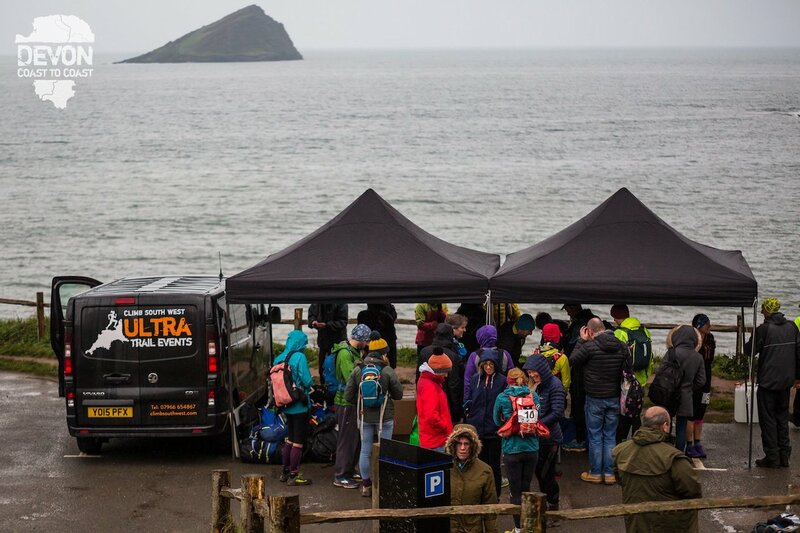 It’s difficult at Wembury Beach, but at the Arc of Attrition for example, you arrive and register in one place and then you are bussed to the start. I’d also argue that the three main checkpoints need to have improved facilities. This is a long old race in potentially tough conditions. The food on offer needs to be more plentiful and of better quality. There need to be medics at all three checkpoints and volunteers who are totally on point, helping to sort runners out with drinks, food, medical intervention and positive psychological encouragement. I found the volunteers I had contact with to be very helpful, but I know some people felt things could have been better. Again this is all in a possibly unfair comparison to other more established races of this type. In terms of the route, this is another tough one to call. The weather influenced a huge part of my impression. I enjoyed running over Dartmoor and Exmoor. But the bit in the middle I found somewhat tedious and dreary. Trudging through mud, through endless boring fields was pretty soul-sapping. It didn’t feel exhilarating and exciting. It didn’t feel like an adventure, in comparison with some other events. You can’t have everything I guess and it’s not Climb South West’s fault that the weather played such a part. If you are prepared to put up with the middle bit, which is probably perfectly pleasant on a warm summer’s day, then the two moors part of the Two Moors Way is really good and definitely worth seeing. 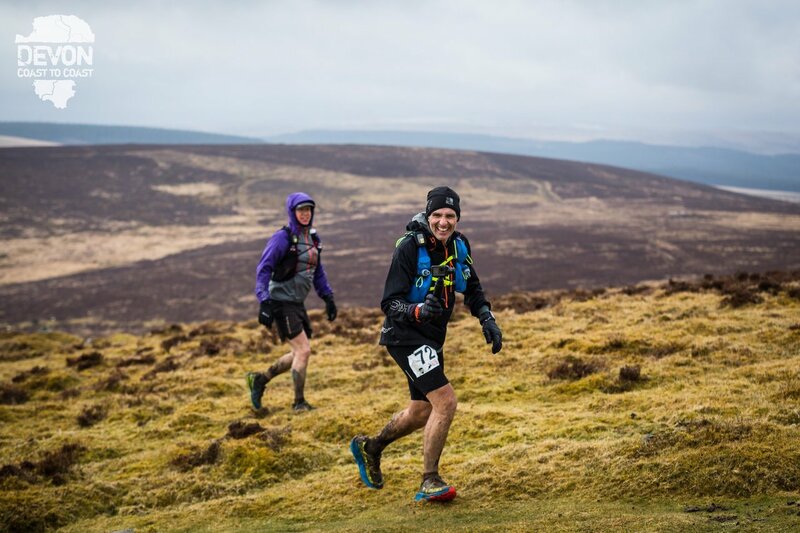 If you read the literature about the Two Moors Way, you might be forgiven for thinking that the Coast to Coast Ultra would be an excellent event for someone doing their first 100 miler. But if future weather conditions are anything like what we experienced, then it’s one of the toughest 100s in the country at 112 miles with virtually 5000 metres of elevation gain. In your favour is a very generous 48 hour cut off, which allowed 48 of the 69 starters to finish the run. The final runner coming in at 46 hours 30 minutes. Richard and I finished in 7th and 8th place in 33 hours 15 minutes. Well over the 30 hours we predicted when we started but we’ll take it given the conditions! Almost always, when I write race reviews, the opinion is mine and mine alone. 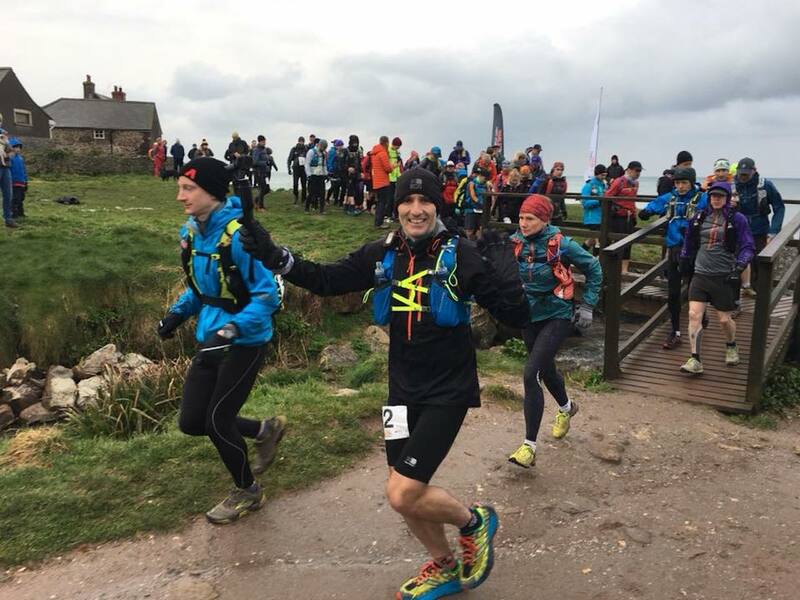 On this occasion I thought I would ask a few people to chip in and offer their own opinions on the inaugural Two Moors Way Coast to Coast Ultra. I felt I had some gut reactions to the race which may or may not have been fair and so I have included here a few reports from others who took part. First up is the winner of the race. Completing his very first ultra in a truly remarkable 26 hours 14 minutes, here are the views of Alex Lockett. 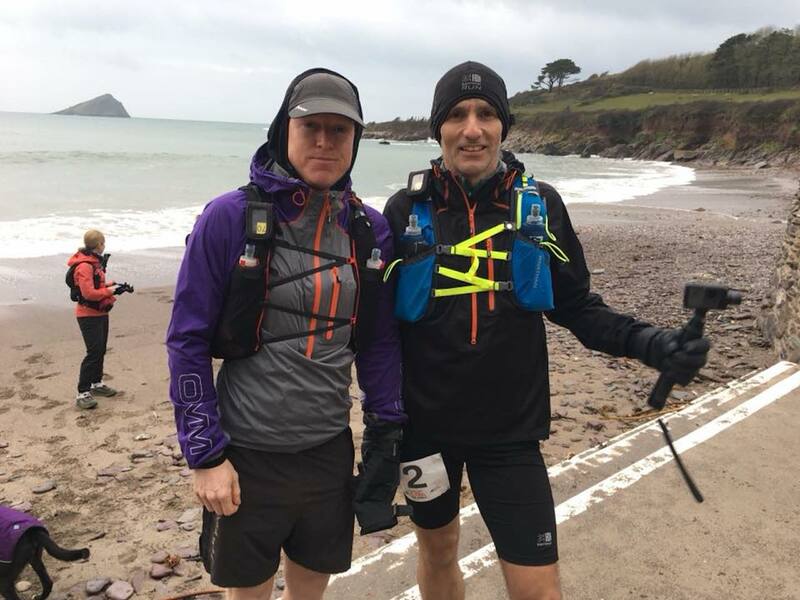 Climb South West (CSW) hosted the inaugural Devon Coast to Coast – Ultra Marathon over the 2018 Easter weekend. The gruelling challenge was worth it for the majestic experience of crossing this iconic route. Pertinent to the season, it was an experience of extreme hardship followed by elation and resurrection. The organisation and delivery of the event was first class, exactly as had been advertised. The route combines the Erme-Plym Trail from Wembury to Ivybridge across the South Hams and then climbs on to Dartmoor to join the Two-Moors Way, incorporating Mid Devon and Exmoor finishing at Lynmouth. It follows a mostly way-marked trail along high exposed ridges to sheltered river valleys, with farmland, forests and villages in between. Navigation is mostly straightforward with a basic map reading ability advised to back up any reliance on GPS. For the event I used the Harvey – Two Moors Way map, with no requirement for GPS. I managed to ‘recce’ the entire route over 4 separate days, this proved extremely worthwhile, particularly on the unmarked wild sections of open Moorland and throughout the night. CSW had kindly placed flags on the open stretch of South Dartmoor before Holne to highlight the best line to take and aid the confidence of anyone less familiar with the area. Whilst it may not be possible to run the entire route before the event, I would strongly recommend at least getting a feel for the terrain in order to gauge a realistic pace. In Spring the ground is likely to be saturated and it was no surprise that the theme of the event was energy sapping mud and bogs. That said, the views and exposure are truly breath-taking, take as much time as you can to look up and enjoy them. Whatever you use to navigate, as an absolute minimum a thorough route study of the map in combination with ‘Google Earth’ will prove extremely beneficial. CSW had thoroughly planned the event, with particular credit due for the combination of a 4-Day and Non-Stop challenge. As part of the preparation, guided runs were organised and all welcome to attend. A base camp was established at the River Dart Country Park and robust support network of vehicles, checkpoints and rest stations set up along the entire length of the County. It was evident that contingency plans were in place to include the extraction of runners in the event of extreme foul weather. A cafe was available at the finish with opening times published. An enthusiastic team of personnel tirelessly supported the event including Mountain Leaders, medics and an army of volunteers to ensure everything ran smoothly and safe. This gave credibility to the event and was delivered in an extremely professional manner. The website and email updates in the build up were very informative and plenty of notice was given in order to prepare including the details of the kit-list, route and check-point locations. Any questions were answered in a timely manner. During the event, briefings were clear and the kit inspection was justifiably thorough to ensure the safety of all participants. These were positioned approximately every 10 miles providing water and high calorie sweet and savoury snacks. At the 1/4, 1/2 and 3/4 points community centres were used to provide shelter and more substantial hot food and drinks. A bag-drop was available at the 1/2 way point and had been coordinated well to arrive at the finish. Participants had been advised to carry the normal snacks/gels that they were used to which is sensible as everyone has their own particular needs and favourites. A GPS tracking system was in place for the organisers to monitor the progress of the event. Although fallible like any system, this was backed up physically with sufficient manpower along the route. The support network had clearly been well thought out, it provided the right amount of shelter, calories and hydration necessary for any competitor. 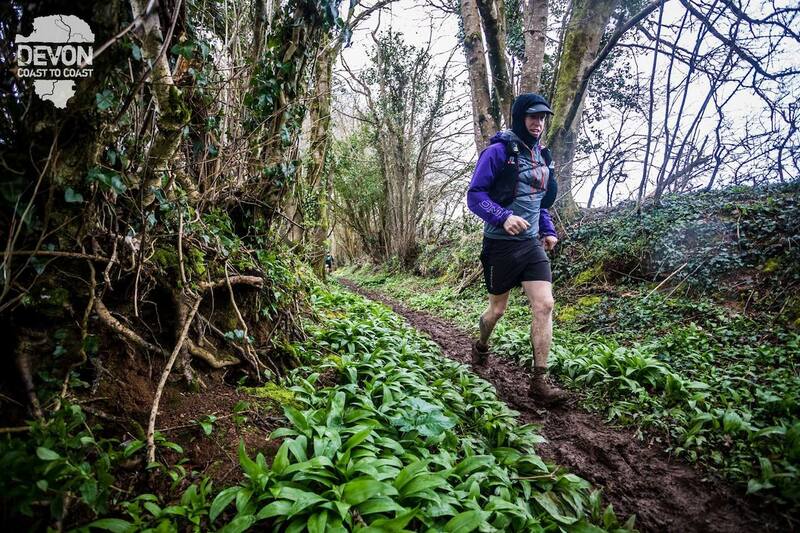 Climb South West have organised superbly the inaugural Devon Coast to Coast – Ultra Marathon. The conditions were extremely tough, only adding to the appeal and challenge to cross this beautiful County from South to North. Every detail of the event was well considered with safety being a paramount throughout. 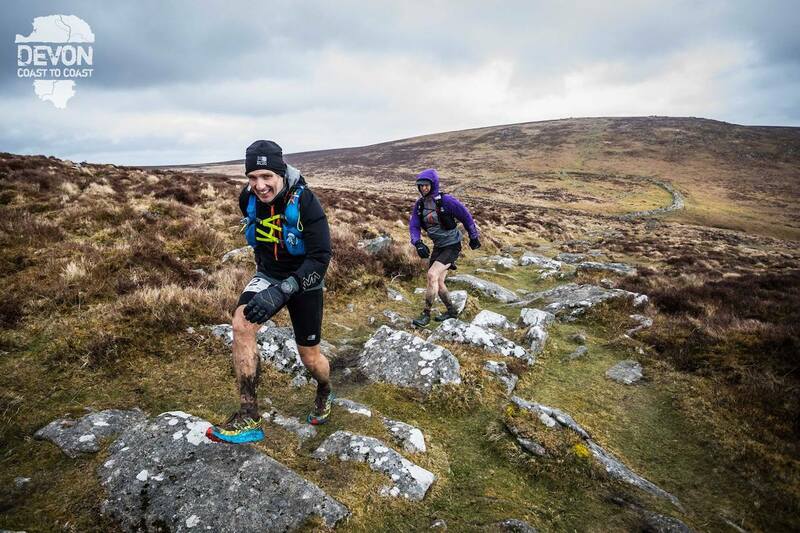 A truly epic event in any conditions – run by runners, for runners! 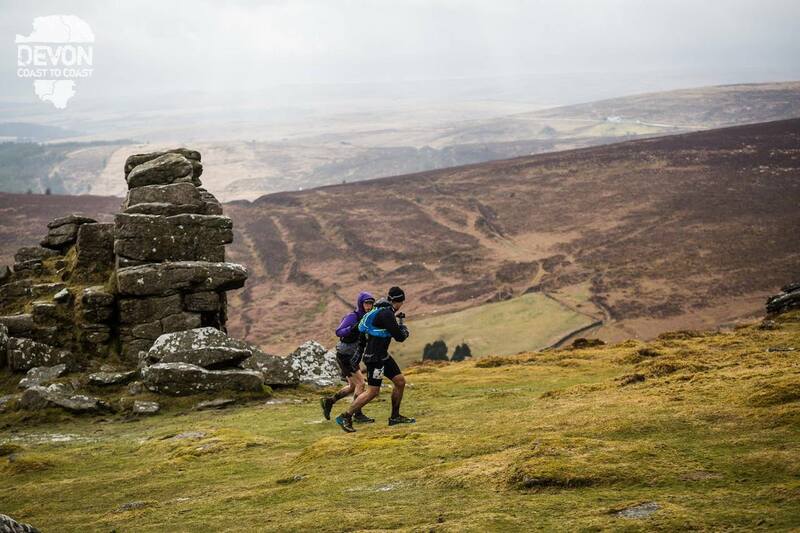 The route was absolutely epic, especially across the stunning open expanse of Dartmoor. A bitter headwind during the first day and the wet slop underneath the feet made for tough going but that really made me appreciate getting into the warmth and comfort of the checkpoints, which were expertly looked after by a friendly crew throughout. This was my first 100+ mile ultra, I really struggled at times but as soon as I got into a checkpoint the encouragement and support of the marshals immediately lifted my spirits and got me going again. I was exhausted by the end and had to walk the last 20 miles which did meant I got caught in the rain crossing the final exposed section of Dartmoor. This was hard going and made me appreciate having a good coat – decent weatherproof kit is essential for this race (and I’d highly recommend waterproof socks too!). Generally the route was pretty well waymarked although you do have to train your eyes to spot some of the older and more subtle signs and a map is definitely needed to get you across. The River Dart country park was a great base, I camped before and after and the facilities were great (good food and hot showers); getting to and from the start would have been very difficult for me but fortunately the guys at Climb South West made transport available to and from the campsite. I have done a couple of other Climb South West events – Dartmoor in a Day and The Winter Traverse. They are local to me and I like the fact that they’re not billed as ‘races’ as such, more like social groups of similar paced runners – low key and friendly. The C2C caught my attention because it’s a trail I’ve always wanted to follow. I already knew the route from the South coast up to Castle Drogo as it’s an area that I already run on regularly, so to have the opportunity to just keep going to the other end was too good to miss. It also gave me an excuse to make my way up to Lynmouth on recce runs earlier in the year. Climb South West can’t take all the credit for such a fantastic route; Dartmoor and Exmoor are so unspoilt, wild and stunning, but they are the first (I believe) to have made an ultra running event of it. I also know that they have a very knowledgeable team who are not only keen endurance runners themselves but also have navigation/mountain leader/first aid qualifications so coupled with the trackers we were given, safety was never a concern. I thought the village hall checkpoints were brilliant. Hot food, hot drinks, chocolate eggs and no concerns about the amount of mud that was trampled in – perfect! (CHOCOLATE EGGS!! )The smaller mini-aid stations were a nice welcome sight and all the marshals were very friendly, supportive and encouraging. 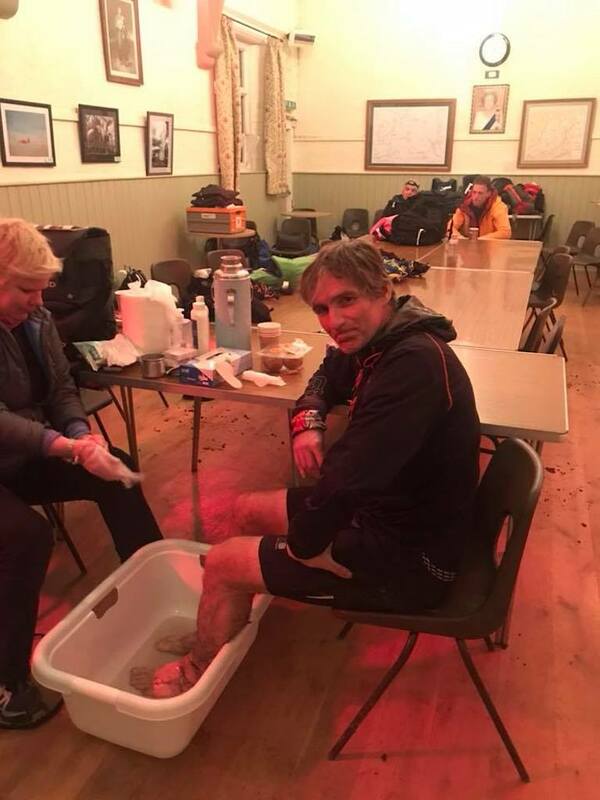 To be honest, I can’t find many negatives – there was a rock that got in the way of my toe on Exmoor which was a bit of a low point, and I could have done without the snow over the top of Cheriton Ridge, but I don’t suppose I can blame the CSW team for those. If I’m really picky I could say it was a shame the start was 15 minutes later than planned – that’s 15 minutes less daylight for me as I was making my way down through the woods into Lynmouth in the rain. I pulled out at 70 odd miles due to a number of reasons, mainly having a lot of family and work commitments and was feeling guilty and selfish for being away for so long. The fact I got lost for hours in those fields in mid Devon that would have added to my finishing time was a final push. That was my fault though for having a flat battery on my Garmin. I love the route normally, it was extra tough that weekend but that’s all part of ultra running. I think the guys did a good job considering such brutal conditions, the checkpoints were adequate and I was sorry not to complete but I wasn’t in the right headspace. I asked four people, two men, two women, some with years of experience and others with less experience of these kinds of events. I did get the views of one of the runners from further back in the field but I’m not sure they wanted me to publish. But it seems my concerns are generally not shared by others who took part. As I’ve stated, Climb South West are learning the ropes when it comes to staging ultra races of this nature and they certainly can’t help the weather. I look forward to seeing how they progress as a company and perhaps taking part in another of their events in the future. Thanks to Christian at No Limits Photography for some of the photos used here. Really good and honest review Stephen, as always love your films and write ups, and being away with work they are keeping me entertained and in touch with the ultra world back home. I think your review of the event couldn’t have been more honest, especially as you’ve experienced other events including AoA which we both know is a very hard but well organised event. Reading the other reviews you added into yours most haven’t run a 100 before and some not an ultra before so really don’t have anything to compare, so I wouldn’t be to critical on yourself for your opinion on it. Well done to both you and your partner for finishing in what sounded delightful conditions! I look forward to hopefully seeing you at next years AoA if you’re running again and I’m not away again.